OREM, Utah, October 8, 2013 (ENS) – VIA Motors, a Utah company that electrifies new pickup trucks and vans from major automakers with its proprietary electric power train, has won a $20 million dollar contract from the U.S. Department of Energy (DOE) to supply the vehicles to fleets. 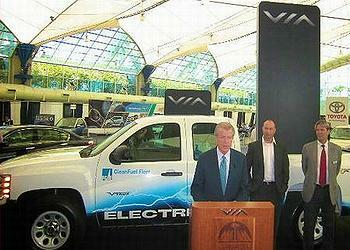 VIA Motors President Alan Perriton announced at the Plug-In 2013 electric vehicle show in San Diego last week that VIA has signed a contract with the DOE to build and deliver electric pick up trucks and vans to over 50 participating fleets. VIA uses a second stage manufacturing process to integrate its proprietary V-DRIVE™ power train into new vehicles made by original equipment manufacturers. The V-DRIVE-equipped vehicles are then sold directly to fleets under the VTRUX™ brand name. VIA VTRUX deliver up to 40 miles of battery range and unlimited extended range, averaging over 100 miles per gallon in typical daily driving, said Perriton. VIA Motors’ powertrain was designed to work in popular light trucks such as the GM Silverado, the Ford F-Series, and the Dodge Ram series trucks, yet it fits a wide variety of light trucks, SUVs and delivery vehicles. Under the DOE contract, the company will install proprietary technology in each vehicle that will record and transmit real-time data to the Idaho National Laboratory, one of 29 national labs across the United States operated by the DOE. The Idaho lab specializes in evaluating vehicle performance and energy consumption. The data developed by this lab will allow the Energy Department to quantify improvements in fuel economy and emissions of the VTRUX vehicles compared with identical vehicles as they roll off the original automakers’ assembly lines. The DOE plans to publish this data for use by government agencies, participating fleets and the general public to help quantify the benefits of operating plug-in electric vehicles. VIA’s electrified pickup trucks have demonstrated the potential to reduce gas consumption and emissions by up to 80 percent on average in early beta testing with large fleet customers, said Perriton. The DOE contract is administered by the South Coast Air Quality Management District with the Electric Power Research Institute acting as project manager. The California Energy Commission also is participating the program. “Plug in electric passenger vehicles are now becoming widely commercialized,” said Matt Miyasato, deputy executive officer for science and technology advancement with the South Coast Air Quality Management District. “Expanding the commercialization of near zero-emission vehicles to include pickups and cargo vans will drive us closer to our goal of a near-zero emission transportation sector,” he said. “The pick-up truck is the number one selling vehicle in America and VIA Motors is the only automaker building electric light-duty pick-up trucks, cargo vans and passenger vans,” said Perriton. In March 2012, VIA Motors received the National Work Truck Show “Green Award” and signed an agreement to supply electrified vehicles to the fleet operated by Verizon, second-largest mobile network operator in the United States.